William John Isbell was born on 11 April 1898 in Hindmarsh, South Australia , son of Waldron Richard Tristram Isbell and Agnes Christina Wilson. He died on Friday, 25 December 1970, aged 72 years, 8 months and 14 days, in Adelaide, South Australia , Prior to his death he had been living in Campbelltown. Vera Elizabeth Isbell was born on 26 June 1900 in Hindmarsh, South Australia , daughter of Waldron Richard Tristram Isbell and Agnes Christina Wilson. Stanley Ronald Isbell was born on 1 July 1904 in Hindmarsh, South Australia , son of Waldron Richard Tristram Isbell and Agnes Christina Wilson. 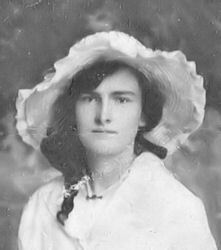 Margaret Ellen Wilson was born on 21 September 1872 in Hindmarsh, South Australia , daughter of William Wilson and Elizabeth Catherine Oxlade. On 5 August 1895, Margaret, aged 22, married William John Chace, aged 32, son of William Chace and Marian McCloud. Hector James Wilson was born on 7 July 1874 in Hindmarsh, South Australia , son of William Wilson and Elizabeth Catherine Oxlade. William George Wilson was born on 9 July 1876 in Hindmarsh, South Australia , son of William Wilson and Elizabeth Catherine Oxlade. Alexander Wilson was born on 4 August 1879 in Hindmarsh, South Australia , son of William Wilson and Elizabeth Catherine Oxlade. He died on Monday, 11 August 1879, aged 7 days, in Hindmarsh, South Australia . Henry Charles Wilson was born on 28 December 1880 in Hindmarsh, South Australia , son of William Wilson and Elizabeth Catherine Oxlade. On 20 November 1906, Henry, aged 25, married Daisy Maud Pettman, aged 22, daughter of William Pettman and Fanny Holman, in Angus College in North Adelaide, South Australia . Ethel May Wilson was born on 9 October 1883 in West Thebarton, South Australia , daughter of William Wilson and Elizabeth Catherine Oxlade. On 17 December 1904, Ethel, aged 21, married Frederick William Paul Grunert, son of William Grunert and Wilhemina Mithke, in the residence of W. Grunert in Adelaide, South Australia . Hurtle Gordon Wilson was born on 15 December 1886 in West Thebarton, South Australia , son of William Wilson and Elizabeth Catherine Oxlade. On 27 September 1911 Hurtle aged 24, married Jane Forest Summers, aged 29, daughter of Edward George Summers and Rachel Eglinton, in the Methodist Manse, Semaphore, South Australia .